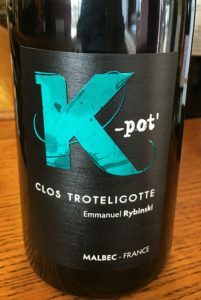 2015 Clos Troteligotte, Cahors “K-Pot” France. I just tasted through Emmanuel Rybinski’s lineup of Cahors Malbec for the first time, and I was wowed by the finesse and beautiful detail I found in these wines, his Clos Troteligotte organic wines are lovely, fresh and very exciting, especially good was his Clos Troteligotte Malbec “K-Pot” Cahors with no sulfur added, which is bursting with vitality and flavor. Made in a similar style to Lapierre’s non sulfur cuvee N Morgon, this pure Malbec has blueberry, mulberry, black raspberry and red peach fruits up front with some plum, currant and kirsch notes as well with hints of sweet herbs, pipe tobacco, mineral and earthy detail. This vibrant and really fresh red delivers a fruity pleasing array of layers along with a fine textured mouth feel, this is certainly one of the most intriguing Cahors wines out there, as a reference point, since I’ve never had these Clos Troteligotte Malbecs, is Fabien Jouves, who is also making more natural style Cahors wines with his Mas del Perie, and though they are different characters they share a certain class and elegance and are leaders in this region most known for a more rustic style. Emmanuel’s lineup is very impressive, the “K-2” his top cuvee is brilliant and more dense a wine that will age and needs time to fully be appreciated, and the low sulfur “K-Or” which is fantastic and a great value, though just a bit less expressive when tasted next to this gorgeous “K-Pot” these are wines to search out, limited and highly prized they will not be easy gets, but worth it. Beautiful and lingering with nice acidity and ripe tannins this 2015 Clos Troteligotte Cahors “K-Pot” Malbec if cellared well should prove a hit, with no added sulfur it will rely on gentle handling and will be sensitive to temp changes, give it some TLC and you’ll be thrilled by what comes out of the bottle, this is charming and very pretty stuff, drink over the next 3 to 5 years.